We have often said how ex-newsreader Charlotte Green's fine diction probably became increasingly disliked within the BBC as the organisation became more and more egalitarian and socialist. She confirms here that this was indeed the case. On the one hand, Ms Green is now at what would assume to be her cultural home: Classic FM. The combination of her gentle RP tones and the graceful classical music makes for very pleasurable listening! On the other hand, she has also gained her "dream job" back the old Islamic/Socialist Broadcasting Corporation: reading the football scores on Radio 5! People are complicated. It just occurred to me that Ms Green might also be a lesbian. She appears to be unmarried and cannot have been short of offers. 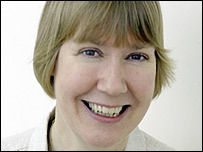 Fellow well-spoken Radio 4 newsreader Alice Arnold is, with her partner (who is beloved of the MSM as if she were a female Stephen Fry - Clare Balding). Ms Arnold was previously going out with another well-known BBC lesbian, Sandi Toksvig. Nothing against lesbians, of course, but should the BBC be under investigation for employing a disproportionate number, along with the obviously disproportionate number of left-wingers?! Anyway... here are some great moments of humour with Charlotte Green. Yes, she's probably a raving socialist etc., but we can try to put that out of our minds and enjoy something nice about her - the thing the ever-downward-aspiring BBC hired her then fired her for: her voice. Charlotte Green speaking to John Brunning from Classic FM and here is the classic "sperm whale" clip - what amused her was the juxtaposition of the name previously mentioned!